1829 – The current building is erected on the east side of Main Street. 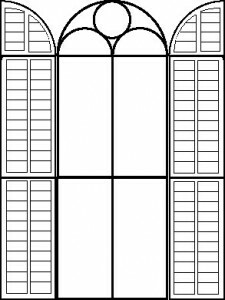 The windows in the upper galleries look a little like angels, the wings formed by the open interior blinds. 1857 – The building is relocated across the street to the town’s former Revolutionary War muster field to accommodate a wider Main Street. 1860 – The sanctuary is remodeled and reversed to face west. 1885 – The main entrance is changed to the current front of the building on Main Street; previously there were entrances on both the north and south sides. 1905 – A serious fire leads to major renovations and a rededication. Also in that year, Orrin Joslin donated a pipe organ in memory of his wife. 1942 – Our communion table was built by Eugene Schofield and Kenneth Chaffee. 1948 – A new and very unique baptismal font is dedicated, given by Dr. Elliott P. Joslin and Mrs. Clarence Daigneau in memory of Ada L. Joslin and Louise Wellington Mayall. Dr. Joslin was an internally known specialist in the treatment of diabetes, and the stone that forms the font’s bowl was a Joslin family treasure. Originally hollowed out by Native Americans grinding maize, it rested outside the door of the Joslins’ Connecticut home where it was used by the children to wash their bare feet before entering the house. It came with the family when they moved to Oxford and was used here as a bird bath and to water the dog. Now a baptismal font, the stone is held by an angel pedestal, designed by sculptress Amelia Peabody and cast in South Boston by Italian stoneworkers. The font and pedestal weigh 800 pounds and stand at the front of the sanctuary, resting on a carrying beam. It is never moved. 1956 – A stained-glass window is given in memory of Walter and Katherine Lovett by W. Lester and Barbara Lovett Wyatt. 1957 – A Baldwin electronic organ is donated through the Edgar and Sadie Dimock estate. 1970 – Wall to wall carpeting and pew cushions are installed. 1982 – A new Allen electronic organ is dedicated. 1987 – A small elevator is installed and dedicated. All four levels of the church are now accessible. 1993 – A set of hand chimes are donated in memory of Donald Prouty and a choir is formed. 2004 – Steven Richardson, church member, builds a beautiful new pulpit. Funds are donated by the family of Diane Brodeur, longtime church secretary, and the pulpit is dedicated in her memory.